Looking at the plateful of ingredients above, isn't that colouful and tasty combination? 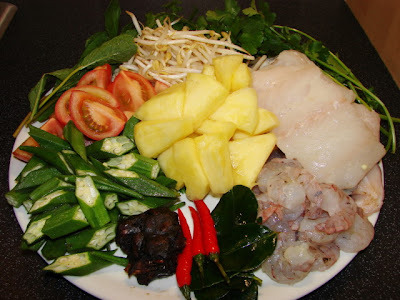 This is more or less the typical ingredients for the popular Vietnamese sour fish soup called Canh Chua. It's very refreshing similar to tom yum but less spicy (unless you throw in lots of chillies). I was reading up on this when writing the last post on S E Asian Ingredients and found many different recipes. 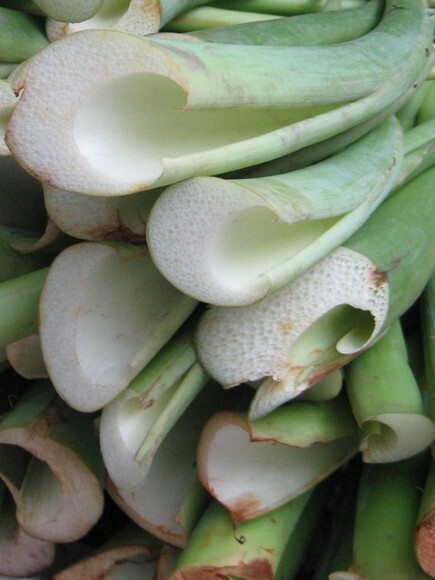 Typical recipe always has a Vietnamese citrusy herb called padi field herb or ngo om in Vietnamese and taro yam stem sometime called elephant ear stem or bac ha in Vietnamese. I could not find both or I left them out, and sub the herb with coriander and mint. If you hate okra because of its sliminess don't fear, the slim actually dissolves in the soup no trace of slim at all, very nice. Also if I remembered taro yam stem (had this many million years ago), it also has the same sliminess as okra so beware okra hater, but I guess if okra slim does dissolve in the soup so will the taro yam stem. For the fish part, any fish will do as long as it is superbly fresh, with or without bones. Catfish is common with the Vietnamese. I wanted something with lots of flavour all I could get was some nice looking cod fillets. It's a bit bland for fish soup so I thrown in a handful of raw shelled prawns so can't really called this soup Canh Chua Ca as Ca means only fish, don't know what seafood word for Vietnamese so I just left the Ca out of its title. The soup was very tasty indeed and more refreshing than tom yum. I made a big pot I ended up having nearly half the pot on its own without anything else for dinner. This was what I used for the soup, all ingredients are in approx. weight, you can use any proprotion you like. Once you have prepared the ingredients it takes only 5 -10 minutes to cook, very very easy recipe. Heat a non sticking wok or frying pan with oil till very hot and fry the fish and garlic on high heat very quickly for about 1 - 2 minutes till the outside is lightly brown. If the garlic beginning to burn take them out first. Frying the fish gives the soup a nice flavour but if you really want a slimline soup you can leave the frying, just add fish pieces straight into the hot broth. Once the fish is fried take them out and leave the garlic pieces in the pan. Add stock, kaffir lime leaves and chillies to the same wok or pan heat till boiling, add vegetables and pineapple chunks and bring to a gentle boil till vegetables are tender about few minutes. Add in the tomatoes at the last minute. Add in tamarind juice, tasting as you add that in bit by bit till you like the amout of tartness, then season with enough fish sauce and maybe a tsp of two sugar to taste. 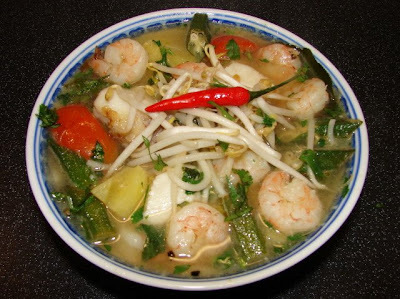 While the broth is boiling hot, add in the fish, prawns and bean sprouts and just cook it for around 1 - 2 minutes till the prawns have gone opaque pink and the broth is hot. Turn the heat off add in chopped herbs.